I would only hope that by now the notion that the best singers and songwriters are the ones with the most name recognition or Facebook “likes” is a bygone myth. Music is such a mess at the moment, you’re more apt to find something meaningful at a local open mic as you are listening to the radio or even searching the internet. 2015 was a terrible year for music, and 2016 so far isn’t shaping up much better. East Nashville feels tapped out, and Austin was done many years ago. The best music happening right now you’re likely to never hear, unless you’re one of the lucky ones to stumble upon a local artist with world class talent; an artist like Dori Freeman. You shouldn’t be expected to recognize the name, and don’t expect her to blow up overnight. But she just put out the album that so far in 2016 everyone in the country and roots world should be paying attention to instead of trying to figure out how to stylize themselves to the Dave Cobb sound, or do something different for different’s sake. The town of Galax, VA sits in the shadow of the Appalachian mountains and not too far from the North Carolina border, and it’s an unlikely place to happen upon a hopeful and promising songwriter, but not because the town is bereft with musical heritage. Galax is singing with music in fact. It’s the home of the 80+ year-old Old Fiddler’s Convention and other annual events that make this small town loom large in the ethos of American string music. Dori Freeman is clearly influenced by bluegrass and old time country, but she’s no champion fiddler. She’s a singer, and a songwriter who should be heard well beyond the corners of coffee shops or at winery gigs in the lower Virginia region. For the love of God just let the songs speak out and choose their own path, and that’s what happens in this self-titled release. The sentiments are so naked and pure, and as potent to stirring the spirit as the smell of a baby’s head that it awakens more than just an appreciation for music, it awakens an appreciation for life. The first two songs of of this album, “You Say,” and “Where I Stood” are just Dori and her guitar, except for harmonies on the second one. This album is fearless in how it recognizes what genius these songs are, and knows to get the hell out of the way and let them blossom. By the time you get to “Go On Lovin'” you’re already hooked, and that’s when Dori hits you with that slow and laid back traditional country magic. For such little effort, there’s so much diversity on this record. As Freeman moves into “Tell Me,” she’s evoking more of a folk pop influence, yet the shying away slightly from the roots only strengthens the sway of this music upon your heart. Just as this album is a mastery in the conservation of sounds to allow the songs to shine, Dori’s voice is this fiercely pure force of nature. It’s the simplicity and dryness of her tone that gives it such strength, and when she warbles in the chorus of “Tell Me,” it’s like the audible cry emitted from a yearning heart. “Ain’t Nobody” is her Tennessee Ernie Ford moment, but served up in her own special finger-snapping a capella way. And for all the texture and emotion this album unloads on the listener in the first half, the second may be where the songwriting finds its greatest depth. “Still a Child” is like three songs in one. 2016 is still a young, fertile lass and much more still needs to be determined. But I get the sense we’ll be talking about this album again come December, and Dori Freeman will not be a name unknown, but the one of the select few to be measured by. That is a good find, I never heard of her except once recently in the comments and this review now. I hit play with the speaker of my phone to my ear on “you say”, I had to stop and do a double take, I checked the running time 00:19, and I was already hooked. I don’t know I could see her getting very big, this is the kind of person you want to blow up. If this very high quality music were to go mainstream, everyone else might have to step up their game to compare. Awesome, review. What do you mean 2015 was a bad year for music? We got “Something More Than Free,” “If I’ve Only One Time Asking,” a whole bunch of new work from Buckethead, a killer new work from Steve Martin and Edie Brickell, we got my personal favorite: “Squelch” by Boland, and we got great reissues of Vernon Oxford. And if you think 2016 is shaping up poorly then you obviously haven’t heard that Loretta is in the studios with new material, as is Sturgill Simpson, and so is Willie Nelson. Anyway on to the Dori Freeman thing. I like what I hear. This is what good music sounds like. These songs are well written and don’t get bogged down in trying to prove themselves, and her voice, though maybe not as refreshing as or unique as a Lisa Vroman or an Emmylou Harris, is an emotional voice that makes the music seem like a sentiment as opposed to a project. I think “You Say” works well for so little, but it could be fleshed out so many different ways. Triple Fiddles man, triple fiddles. I’m not saying there weren’t some good albums in 2015, but I think the consensus would be “Southeastern” was better than “Something More Than Free.” I enjoyed the Daniel Romano album, but he used a drum machine for some drum tracks, and a mellatron instead of strings. I understand it may be a weird, or even jarring thing to say at the beginning of an album review, but the reason I mentioned how bad 2015 was in my opinion is because of how great this album is. Independent country and roots music right now is so overthinking it, it’s ridiculous, and it’s all dying in the production and arrangement. There’s some great songs, and great artists out there, and they’re putting out less than great albums because they’re trying to be hip or follow some stupid east Nashville trend. Someone mentioned earlier today that Sturgill Simpson is bringing horns out on the road. That’s what everybody’s doing. Everyone wants a horn section. Why? It’s self indulgent. What is it really lending to the music except taking the listener on more step away from the magic of a strong voice and a sweet lyric. I stood up and gave this album a standing ovation after listening to it because it had the bravery to just be itself. It’s been so frustrating to listen to new music lately, and this was so refreshing, like a weight lifted off your chest. Dori and Teddy Thompson deserve high praise. Why is it a slander against Daniel Romano that he used a drum machine and a mellotron? The record certainly doesn’t suffer for it. You’ve got to use what’s at your disposal and what’s available sometimes. I didn’t say it was “slander,” I just think it’s a little bit lazy. Like I said, I really liked the Daniel Romano album and gave it a glowing review. But it could have been better if extra effort would have been put out in the production, like we hear on this Dori Freeman album. Listening to an album like this reinforces my feelings about this. I’ve had his album on HEAVY rotation lately, definitely one of my favorites of the year…hopefully he will get the recognition he deserves (& with that, a bigger budget). I’m sure a real strings section does not come cheap. Regardless I get what you’re saying – liking these two songs btw, will have to look into her album / other work! Trigger…your comments about the Cobb sound and the statement above sums up the scenario succinctly . Music isn’t rocket science . It’s about how to best serve the lyric…..the song …..and that mandate starts and ends with a voice. The rest is either supporting or distracting unnecessarily and that’s when you are into trend-chasing. This is a beautiful example of serving the song by maintaining the emotional intent and not getting in the way of your most important instrument – the voice . And it isn’t necessarily about genre although traditionally country/bluegrass/folk/roots has always been aware of and acknowledged that mandate . Lots of ‘rockers’ have recorded stripped down songs which allowed the emotion of a vocal and power of a lyric all the space they required to connect ( Brian Adams , Rod Stewart , Springsteen ) AND be commercially successful . The songs posted above certainly indicate that Dori gets that aspect of having a song connect by serving it completely . The fat has been trimmed lyrically and musically and there are no vocal affectations ( Jennifer Nettles ) to impede the song’s mission . I know I have referenced this artist several times before ….but in case any readers missed it , check out the great Tom Jones’ last trio of albums to understand how all you need is a great lyric and an artist who understands that the lyric is paramount to connecting with listeners . Glad to see this reviewed here. I read the review on Country Perspective a few days ago and was hooked as soon as I listened. This will surely be one of the top albums of the year. Go In Lovin’ especially stood out to me. There are times on the album where her voice reminds me slightly of Zooey Deschanel and also a bit of Caitlin Rose. On a side note, and as Fuzzy TwoShirts brought up, I also am always very confused when someone says that 2015 was a bad year for music. I’ve seen Trigger as well as other commenters say that before. Personally I thought 2015 was an amazing year. Way to many good albums to list here! Holy smokes that’s some good stuff. Beautiful, crystal clear voice, simple but powerful lyrics, and pedal steel to boot! I’m somewhat puzzled by the statement that East Nashville feels tapped out. I understand the underlying economic issues which threaten it, but on a musical level, Margo Price is currently set to make a big splash, Cale Tyson has a new album coming later this year that I’ve heard good things about, Kelsey Waldon is working on new stuff, and I continue to hear buzz about artists like Andrew Combs and so on. I might be missing something, but if anything I would think a lot of the artists associated with that scene are just picking up steam. To some degree, isn’t that that related to the whole neo-outlaw / roots music revolution thing that’s been written about here previously? Anyway, the Dori Freeman stuff is really nice. There is a refreshing naturalism to the way she sings. There’s still some great artists in east Nashville, and I’m sure there will still be some great albums coming from there. But they will have to slog through the trends of bringing in horn sections and purposefully making your recordings sound like crap because it reminds them of records for the 60’s, and EVERYBODY wanting to get that “Muscle Shoals” sound on their albums. Think for yourself, let your music choose its own path. 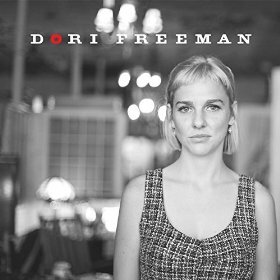 This is the lesson of Dori Freeman, and it was my adulation for this record that made me feel inclined to blow some steam out about what’s happening with independent country and roots right now, which is too many people records are sounding the same. I like what I’m hearing so far from Dori Freeman. Off-topic a little – Gary Nichols (from the Muscle Shoals area) of the Steeldrivers is apparently working on some of his own music that I expect will be pretty different from the bluegrass group’s material. He was a country solo artist years ago, but has the versatility to do a lot of things. He writes, sings, plays. Damn, I can just imagine listening to this music on a nice morning while I relax, drink my morning coffee, and get ready to take on the day. Or anytime I just want to relax for that matter. It just has that kind of nice, carefree feel to it. Simply amazing and old timey. Thanks for bringing this album to light! I’m from Galax, VA. My mother was Dori’s second grade teacher. I appreciate your honest and wonderful review of a good “Ole Mountain gal” who has the talent and soul to shake up the real roots music scene. Not surprised she’s from there! Have friends in Grassy Creek, a ton of musical talent in that area, when I was a kid we’d go to the fiddlers convention saw Doc Watson & many others, and I remember they used to take us to a little community center type place where they had a weekly picking / music session that everyone was welcome to play in. Haven’t thought about those days in quite a while – thanks for reminding me! #Ambivalence for me. She looks cute in a pair of sunglasses tho. Fantastic! Downloading from iTunes now after listening to the YouTube clips. Loving the two songs here. Purchasing the album now. Don’t know what I would do without Saving Country Music and Country Perspective to turn me on to gems like this. Apart from the two somewhat uninspired pop songs in the middle of this album, this is just pure joy. Oh, how I love these songs and this sound. Note to all artists: If you don’t have a very good reason, keep it under 35 minutes. A very good reason that is. Amen to that Gumslasher . I don’t care WHO you are ……nobody has 15 or 16 or more GREAT songs to put on one album .Half will be forgettable filler whether your name is Sturgill , Billy Joel or Beyonce. But if you can’t come up with 9 or 10 you are in the wrong business. If people need more than one or two filler tunes it means they tried to rush the album. American Idiot had “give me novacaine” but otherwise the whole album was very strong. Well it ain’t false. If you have the songs, give em hell and put out a double album! Problem is all the albums that could have been great if not for 2-3 songs that fucks it up. 35 minutes is perfection, but NOT if you have more great tunes that adds to something already great. I think there were more great tunes when there were actual professional writers writing them and fewer albums released ( back when ) . I’ve listened to a lot of more recent Justin Timberlake , Beyonce , Henley, Stapleton Tim McGraw etc-, and most of the new ‘country artists’ . There are just so few SOLID top -to -bottom albums once you get over 10 or so cuts and the artists are the writers. They just aren’t good songwriters in most cases . There was a reason publishers had pro writers on the payroll . They knew how to write songs. Yes there has always be the odd gem , the odd band or artist who can deliver 16 or more solid cuts . But in my experience that is most definitely the rare exception these days and most of the cuts over 10 become filler and unnecessary . Add to that the fact that so few of those songs even get heard the way a complete album was once purchased and listened to . Folks download singles from iTunes . Come on Albert:) Buy the album from the artist. If it is good that is. Brave man mentioning Beyonce around here. Her last album is pure perfection. Pop/soul/rnb whatever. Dori rules 2016 so far. Her voice is gorgeous. I will absolutely be purchasing the record today. My copy arrived Wednesday and I listened to it today for the first time. Wasn’t a real attentive listen, but I really enjoyed it and I expect my appreciation will deepen with each listen. Teddy Thompson is the first born of Richard and Linda Thompson. Richard is my favorite music artist and I have seen Teddy as part of the RTB a couple of times in the late ’90s. Also, Teddy was instrumental in his mother’s musical comeback starting in the early aughts as both a songwriter and a bandleader. Teddy’s third album was a country covers album and was released several years ago. I don’t have it, but have heard good things about it. Thank you, listening on Apple Music now. Remember Linda Ronstadt singing it, was sad to hear of her illness. Well this was an absolutely beautiful thing to listen to on a Friday afternoon. I’m sold. Y’see, THIS is what I’m talking about, right here. THIS is Country music, gawddammit! It’s sweet, pure, beautifully written and sung and it’s honest. If there;s any justice in the world, Dori Freeman will shoot straight to the top and sell out concerts all over the world while Miss Tay-tay Swiftie has to work the Clinique counter at Macy’s. Thanks, once again, Trigger. Keep up the good work! PS – As soon as I read your review, I hopped over to her website and bought the LP. I can’t wait to order this. There is an honesty and purity to the Appalaichia artistic scene which is unparalleled. Maybe it all started with the Bristol Sessions. I get up to Bristol for the car races, and my wife and I get up to Abingdon Va. From time to time. Just driving through where Va, NC and Tennessee meet is itself a cathartic experience. My grandfather was from 20 miles north of Bristol. The Orthophonic Joy project filmed some sort of Bristol Sessions documentary a couple months ago. Great country music can come from anywhere, but that area is certainly a hotspot. Tammy is that you? My lord that second track is just fabulous. And like that she isn’t forcing the southern drawl even though it is there. Listening to Dori Freeman makes me forget it’s only 5 degrees this morning in my part of Appalachia. Good songs, well sung, without an overbearing production. I hope she makes a million dollars. Thanx Triggaman. Yet another artist I likely wouldn’t have heard of if not for this website. Thanks! I really enjoyed this! We shouldn’t be expected to recognize the name? Over a month ago she and her new album were the subject of glowing articles or blog posts in No Depression, Rolling Stone, and Bluegrasssituation.com, among other places, touting her as one to watch for in 2016. More recently she’s been featured on NPR’s World Cafe and its blog of new “Songs we love,” as well as on my local radio station, WFUV in NYC. Frankly, I was surprised that you hadn’t written about her sooner, and had assumed her sound just didn’t appeal to you. I’m VERY glad that my assumption was incorrect. The vast majority of my readers did not recognize the name, and she’s still a lesser-known artist. That’s not a slight to her in any way. I think dedicated music fans sometimes don’t understand how difficult it is for an artist in music to become recognized. They may be superstars to us, but 99% of Americans have never heard of Sturgill Simspon or Jason Isbell. What I was trying to illustrate is that the relative popularity or name recognition of an artists has virtually nothing to do with their talent level these days, and most of the great ones worth listening to are virtually unknown. Hopefully that changes for Dori. I came back to say I’ve been listening to this album on repeat all weekend. I haven’t been this excited about an artist in a while. Thank you so much for the heads up! I clicked on this link from Twitter and after reading the first paragraph the album I had on (ZZ Top’s first) finished up and I put this on and I’m just floored. Wow.